Historians should be control freaks when it comes to data storage. We are data gatherers who scrape archives for any content relevant to our particular research projects. For instance, when I was last at the city archives in Montreal, I asked the archivist for access to the Montreal public market committee records and she handed me a CD-ROM. I sat at one of the computer terminals for about fifteen minutes and copied the entire contents of that disc to a USB data drive. While the main challenge for historians is to sift through and sort those masses of data we manage to acquire from archives, the storage of that data in a digital age posses unique challenges. Fortunately, there are a number of great tools and technologies that can help us with those challenges. I have recently been experimenting with network attached storage as a data storage solution. I found that last semester I was working from a number of different computers as I moved between my campus office, the bus, and my home office. I struggled with keeping the data on all of my computers synchronized and stored in such a manner that I could access all of my necessary research and teaching files from my campus laptop, my smartphone, and my home desktop PC. I was already a Dropbox user but I wanted a solution that gave me more direct control over my data. I wanted my own cloud. It turns out that making your own cloud isn’t all that difficult. I found a great Boxing Day deal on a Seagate Dockstar network adapter with Pogoplug support (you can also just use a Pogoplug network adapter). The network adapter allowed me to connect an ordinary USB data storage device (in this case a 120gb Western Digital Passport drive) to my home network router. Instantly all of the computers on my home network had access to the data attached to this network adapter. Pogoplug provided the software and service to access this data from any other internet-connected device, including my campus laptop and my smartphone. 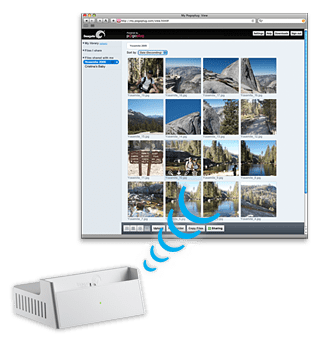 The Pogoplug PC and Mac software allowed me to access the network attached storage drive as though it were a local drive. I was also able to install both the Android and iOS applications for Pogoplug on my mobile devices, giving me access to all of my data while I commute (I’ve also found this useful for meetings when I need to quickly pull up a particular document). Network attached storage has proven itself to be very useful for my day to day work at home and on campus, but it also holds a number of advantages for archival research. With a good internet connection, I have access to all of my data while I work in the archives. I also have a remote drive to upload data I harvest from the archives. In the event that my laptop suffers damage while I’m on the road during a research trip, all of my data will be safely stored on a drive back at my home. Those precious digital photographs of archival material will be waiting for me at home when I return. My network attached storage experiment has turned out pretty well so far, but I’d like to hear about other data storage solutions. Please let me know in the comments section if you use network attached storage or any other strategies to manage your data.